After travelling Morocco for 6 weeks, I decided to fly west to the Canary Islands of Spain, where I would spend 10 days vacationing. I’ve never been an all-inclusive fan, but considering the need for a vacation and the expensive Euro, it seemed more convenient and economic to choose a nice a hotel and not worry about anything. I opted for the hotel Paradise Valle Taurito on http://www.booking.com for its beautiful location, affordable price and multiple attractions (read my personal reviews listed at the bottom). Paradise Valle Taurito is a family self-sufficient resort, offering all the service and amenities you need. Wake up in the morning and enjoy a delicious breakfast on the terrace. Then move to the poolside where you can quietly read a book while sipping on a pina colada. At lunch time, enjoy a fresh seafood paella or snack on a classic burger and fries. If you are in need of more action in the afternoon, move to the waterpark and enjoy the slippery rides. Or simply unwind on your patio admiring the beautiful views of the resort and the ocean nearby. There is also a full service spa for a day of extra relaxation. At night, savour a nice dinner under the stars then perhaps have a stroll on the venue. Shows and entertainment are presented in the public place. There is also an arcade and games room as well as a mini-golf where you can show your skills. If you prefer quietness, hang out at the poolside bar where the friendly bartenders will take care of you. Nothing can beat a nice glass of wine chatting with fellow vacationers. The black sand beach of Taurito is just a few feet from the hotel. Sandwiched between 2 wind shielding cliffs, it makes it a peaceful and comfortable area to relax, take a stroll or simply watch the warm golden sunsets. There are many activities in Taurito to choose from. You can book a package with one of the companies located on the beach. 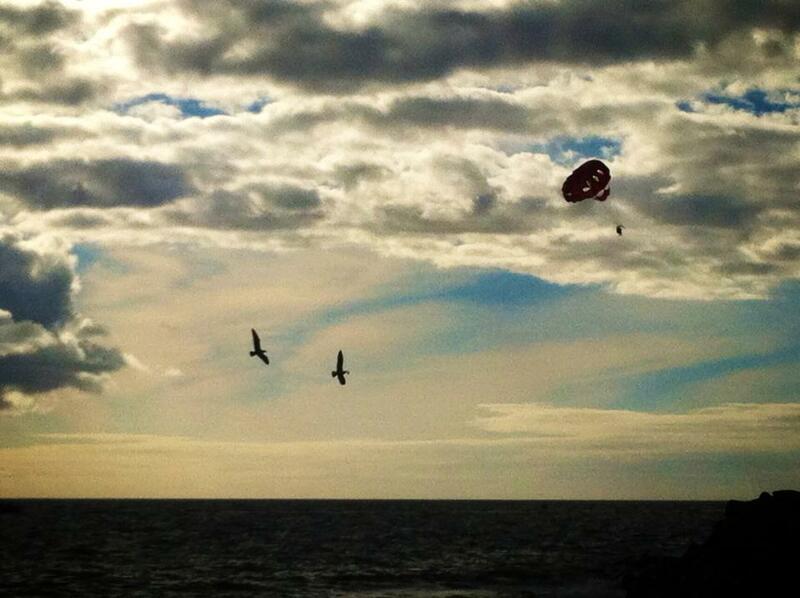 Jetskiing, banana boating, parasailing, snorkeling, diving and sailing are all offered in Taurito beach. I booked a day diving trip with Delphinus and did 2 beautiful dives at the marine reserve of El Cabron. Perched on volcanic hills, Playa Taurito is located southwest coast of the island of Gran Canaria, between the port town of Puerto Mogan and the popular town of Puerto Rico. The sand dunes of Maspalomas are only a short drive away. There you can take a camel ride along the desert-like dunes. The colourful port town of Puerto Rico offers a nice escape whether you want to take a walk along oceanfront promenade, glimpse at the fishermen returning to the marina, have a nice dinner at one of the authentic local restaurants, relax on a lounge chair at the beach or stroll the pedestrianized development surrounded by gardens of bougainvillea, palm trees, bird-of-paradise flowers, hibiscus and other colourful plants. 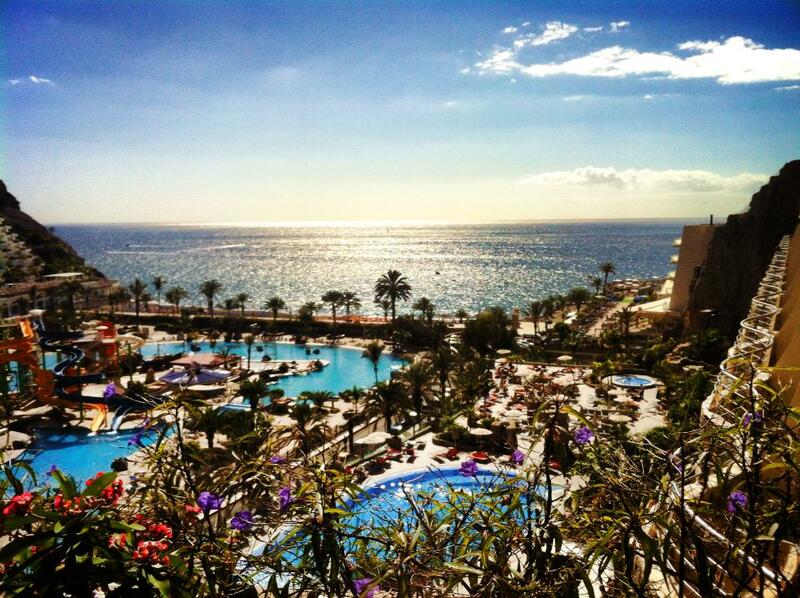 This little “Venice of the Canaries” will simply charm you. Finally, it wouldn’t be a complete vacation if you don’t cruise along the coast. Whether it is by bus, by car, or by scooter, the road along the ocean offers a scenic drive with the perfect sea breeze. 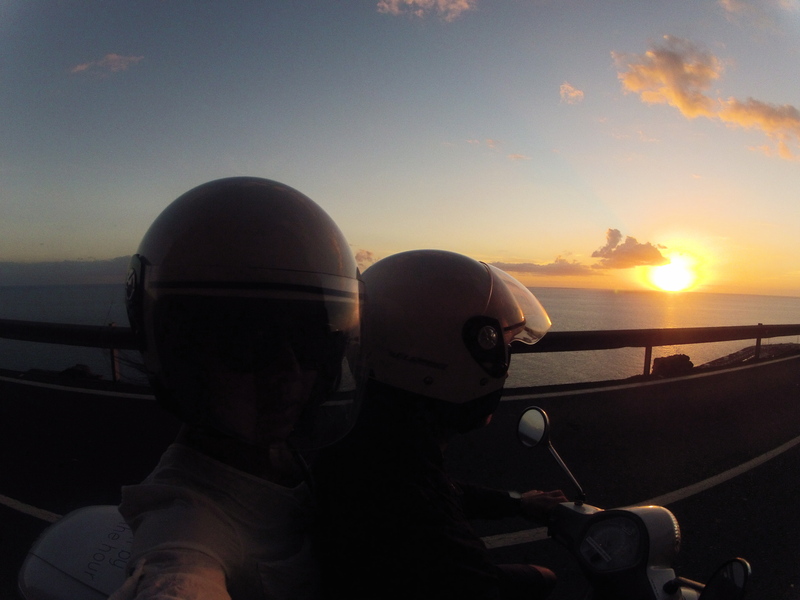 We opted to rent a scooter and rode along the winding cliff roads, wind in the hair, chasing the sun setting over the Atlantic. Epic, scenic, simply majestic. Location: The hotel is located south west of the island of Gran Canaria, between the towns of Puerto Mogan and Puerto Rico. The sand dunes of Maspalomas are a short drive away. No airport transfer is included with the hotel. You can choose to pay a taxi, but be prepared to pay a good 100 euros. You can opt to take public transportation. Ask the bus station clerk at the exit of the airport which bus to take to your destination. To get to Taurito, we took 2 buses, a total of 10 euros each. It took about 1 1/2 hour. Renting a car could be a great option. Hotel: Very clean and comfortable newly renovated rooms with beautiful views of the resort and the ocean. Hotel always clean and well-maintained. Beautiful flowers and gardens. Amenities: Small but nice pool surrounded by free long chairs. Pool tables, hot tub and free access to water park. The water has fun rides, although could need a good deep clean and TLC on the slides. Entertainment is a bit poor, but great for kids. Games room fun, but bowling is expensive. Mini-golf is a must! There is a nightclub that opens late for adults. Doesn’t get too busy and the drinks are not included, hence a bit pricey. Beach is clean and located only a few feet away. There is also a full service spa. Food and Drinks: As most affordable all-inclusive resort, the food isn’t close to gastronomy. It tends to be a bit repetitive, but overall it is decent and eatable. The drinks are also ok. However, the self-service wine at dinner is horrible. Drinks and wine at the poolside bar are way better. Staff: Had a great experience thanks to the staff. Very kind and helpful and, even after long days, they keep their smiles. Good job especially to the service and bar staff as well as the housekeepers. However, the front desk wasn’t too helpful with indications and recommendations, which made us miss our bus and take an expensive cab to the airport.